If you have ridden on one of MetroBus’ newest 40-foot vehicles, you’ve probably noticed a few safety features on board. 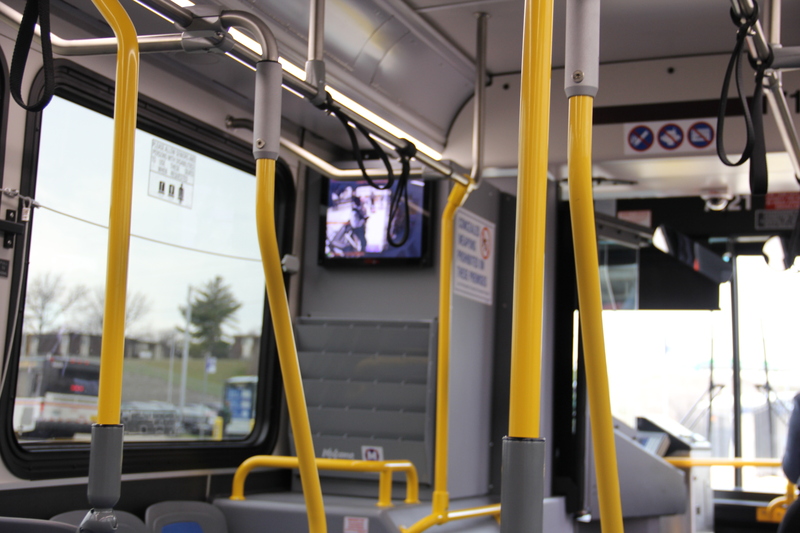 The newest buses are equipped with a monitor mounted directly behind the operator. Currently, these monitors display several different camera views from the onboard security cameras, but can also be used to communicate other messages. You see yourself and your fellow riders on several surveillance cameras positioned around the bus. It’s kind of like when you walk into the grocery store or into the bank and you see yourself up on the camera monitors. It’s a reminder that you and the other riders are always on camera when you are on a MetroBus vehicle and not only are you on camera but you are being recorded. This new feature will hopefully help deter some of the bad behaviors that result from fellow passengers not being respectful and not following the rules. 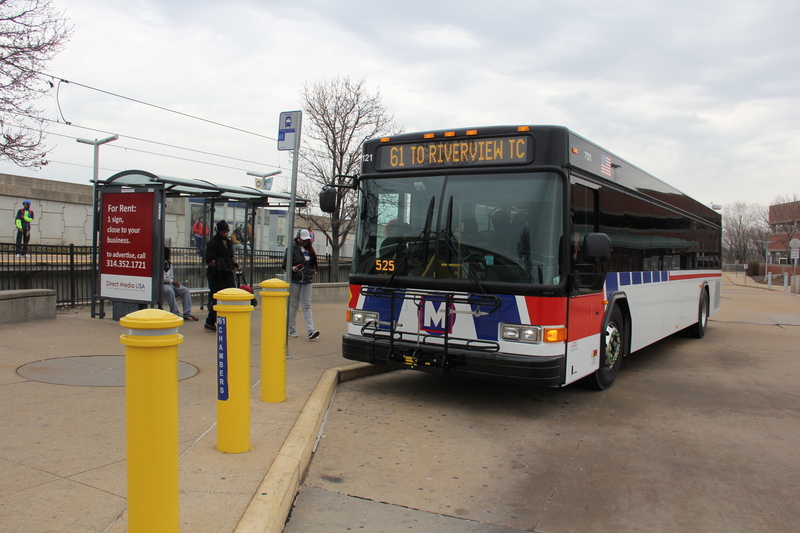 “These are the first buses in our fleet to deploy this technology, and we are initially pleased with the response they are getting from our MetroBus riders,” Executive Director of Metro Transit Ray Friem said. This is the second set of new buses that feature bright, yellow paint on poles and bars inside the bus to make it easier and safer to navigate the steps and the passenger areas. The bright yellow markings also make it easy to see the designated areas where it’s safe to hold on when the bus is in motion. The new buses also incorporate safety features that help in the rider experience. For example, there is a camera on the dashboard that shows the operator the cameras over the doors to make sure everyone safely exits off the bus and away from the vehicle before the bus moves on. The new buses also feature an LED “STOP” sign on the back of the bus which lights up for improved visibility for motorists and pedestrians. Metro replaces approximately 27 buses a year as part of its vehicle replacement program, and that gives us an opportunity to monitor, test and implement new technologies. Metro evaluates these features as they become available to determine their effectiveness, efficiencies and safety elements. We also factor in the cost of installing the new technology features on older vehicles. Metro leads the transit industry in several performance, reliability and maintenance metrics. As a result, we are proud to say we operate buses three years and more than 300,000 miles longer than most transit agencies are able to achieve. It’s because of our innovative, money-saving preventative maintenance program and other transit agencies around the world call us to see if they can model their bus programs after ours to achieve the similar results. When we say we are fiscally responsible, we mean it. A year ago, we celebrated the first bus in our fleet to reach one million miles on the odometer on the original engine. We will make that milestone in the coming weeks with another MetroBus. I rode one of these buses yesterday. The monitor is awful. It switches camera feeds every five seconds which is so fast, it is distracting and unpleasant. It is a awful, mesmerizing reminder of how the transit agency views its ridership. No, it is not. In the grocery store or bank you see it briefly and then go about your business. You know it is there but it isn’t directly in your line of sight aggressively reminding you just how awful your local store suspects you to be during the entire duration of your shopping experience. It is grotesque and dehumanizing to force people to watch themselves under constant surveillance as if they are in some prison holding area every time they travel on public transit. You can use surveillance without it being so aggressive and unpleasant as to rapidly switch angles of surveillance for the entire trip. I also don’t know how you are going to draw higher income residents to switch modes to the bus if they are made to feel like they live in a police state and are treated like criminals. I can see the cameras; that would be plenty for me. I know I plan to do my best to avoid buses with those monitors and will ride my bike if I have to. Please do better, reconsider this policy, and remove the monitors. Or at the very least make the monitor view change ever 20 seconds or something that isn’t so visually intrusive and awful.